If you shoot a lot of 9mm Luger, you know how fast your per-round costs can add up. Nip that in the bud with this 1,000 round case of reliable, inexpensive Tula ammunition. These cartridges fire a light 115 grain bimetal jacketed bullet at a muzzle velocity of 1,150 feet per second. 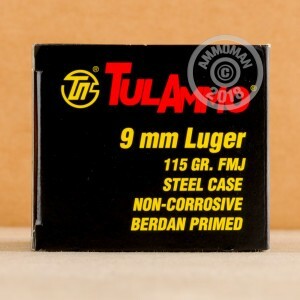 Tula ammunition uses non-corrosive Berdan primers and non-reloadable steel cases. Due to its magnetic properties, this ammo may not be suitable for all indoor ranges. Buy this case (or any other items totaling $99 or more) to qualify for free shipping! I've ordered thousands of tulaammo and never had anything but great success. I dont reload and I like to shoot so why would I not shoot cheap at the range? Runs great in my cz evo scorpion, vp9, sw 2.o, beretta apx and walther. No problem. We have bought a lot of ammo from this Company, multiple calibers. No problems. Fast shipping, great communication. No thoughts of buying elsewhere. Keep up the good work. You have a super customer base. On my second case of this ammo, been running it through my 92FS, 92onyx, 92s and Taurus 99, has run flawlessly, the berettas are easy to clean so the ammo being a little dirty is no big issue. To the person who would like a refund - I wish I could buy what you have left. I've shot about 2000 rounds through a VP9 in a couple 3 day training courses. No problems at all. Yes it's steal cases. Yes it's dirty. I prefer to load my own but gathering my brass is tough in those classes. Don’t worry about bad reviews they’re there for you! This is great ammo! Shoots a little dirty but haven’t had a single jam in my Beretta M9A3. (Thoroughly cleaned after shooting) No failure to extract or fire! I have not had any issues with this ammo. It is accurate and a great price. I run my Ruger blackhawk with this and get great results in consistence and accuracy; I have had no extraction issues with it. I like it and the cost keeps me going to the range! I shoot about once a week. This stuff runs great in my Glock 19 Gen 4. I found 48 out of 50 worked well PER BOX. primers had good hit, but no bang ? 1000 rounds for under 200 bucks and it arrives next day for free?!?!? GTFO!!!! I'm blown away by this company. Definitely would recommend and will be purchasing more very soon. Great target ammo. Went through nearly 2000 rounds with out a misfire. Will keep buying at this price, service and reliability. No problems..my glock loves them..next day delivery as usual..thanks! I have had no failures to fire to date. Function perfectly in my pistols. Out of the first 250 14 Squibs (no powder in cartridge) 7 stovepipes, because of this have been weighing cartridges before shooting and found 3 more in the next container pulled bullet out and no powder in cartridge. They shoot pretty good groups when they work. These round work really well. I haven't had any issue yet. I'm using it im my 2 Beretta92, they work just fine. good accuracy, good bargain for the money. i will buy it again. I honestly cannot see the difference between using steel and brass case, so far I ( wild guess ) am at 5-6000 steel rounds and 2-3000 brass. Colt 1911: 3 ftf, 4 stove pipe, 2 misfires. CZ 75: 0 ftf, 3 stove pipes, 2 misfires, M&P shield: 4 ftf, 0 misfires, 2 stove pipies, 0 misfires. 100 rounds fired in total. We have had misfires. Good primer hit no bang. I love a good price on ammo! I love a great deal and I especially love fast delivery!!! Keep up the great work AmmoMan!!! I have shot over 10,000 rounds of the Russian ammo and have had less than 10 misfires. No squibs. Once in a great while I get a primer that fails to detonate. Also note most of those 10,000+ rounds have been thru the same gun. A glock 19. Have yet to replace a part in the gun. Big discussion about "steel core" ammo. Gun ranges need to go on line and do some research about why Russian ammo fails the magnet test. Not everybody has deep pockets for ammo costs. 3 trips to the range, total of 650 rounds, only 1 got jammed, loaded it back to the magazine and it fires. Just a head-up, I did not clean my gun (Springfield XD) at all with those 3 trips & 650 rounds. So 1 jammed out of 650 round is a really good ratio. I would buy again. Who cares if it is steel & foreign because IT WORKS! Great for fun at the range ..
At the bottom end of the power scale (especially for steel cased ammo which is stickier that brass), which leads to occasional failures to seat in the chamber. Very good product performed perfectly no failures. From time of order to receiving it less than three day's,outstanding service!! I am very happy with my purchase,it is nice doing business with a company who truly cares for the customer!! I don't like anything made in Russia but this is an exception. Went through 1000 rounds with my CZ and not a single issue. I'm starting on my 4000 th round of this ammo and it has been nothing but a pleasure. My glock 19 gem 4 loves this stuff. I think out of 3000 rounds I have had only 2 fte, no ft from and no feed issues. As for AmmoMan, this is my 1st time using them and couldn't be happier. I placed my order on a Saturday night and receive them on Wednesday morning. The price was right too. At this point I will definitely purchase again. Customer service is what I look at because the product hasn't failed me. Works great in a "combat" pistol that's looser in specs like a Ruger P89-94, or a standard 9mm 1911. I wouldn't use this stuff in a tight match pistol. I used this ammo in a match today and had one major jam, I won't use this stuff when it "counts" but it makes great, affordable training or "fun" ammo. I also love it in my 9mm Ruger Blackhawks, where ejection and dirtiness aren't a factor. My CZ P07 Duty and my wife's Beretta Storm subcompact fired all this ammo in one month. Absolutely NO malfunctions. Both pistols cleaned up nicely with little effort. I have been a long time buyer from Ammoman and have no complaints. 10 shots in 3 inchs at 10 yards with Glock 17L on a rest! Good for me! I had no trouble with stuck cases and the ammo proved very accurate in my Glock 17L target pistol. A very good buy. Of course, freehand the spread got bigger, but that was me, not the ammo. My buddy and I got 1000rds to test. We blew through it using a Beretta 92FS, two different Glock 17's, a Glock 34 and a Springfield XDs. Out of a thousand rounds we had absolutely ZERO malfunctions! No failure to feeds, no failures to eject, nothing! This ammo is cheap and dirty junk, but it's one heck of a reliable bang in our experience! It go's bang, i went through all 1000 in about 2 hours, not a single one messed up in any way. Guns were dirty, but any gun will be dirty after 1000 rounds. Not the most accurate ammo made, but again look at the price. They smoke quite a bit, which is a good thing, if there are bugs present. Everyone puts Tula down but it worked great for me out if my CZ P07 duty. Very happy with Ammoman. Just fired 200 rounds through my STI. This Tula 9mm ran flawlessly, no jams, misfires...Fast and accurate...Great price!!! I didn't care for the steel cases and I felt it shot dirtier than other brands. Shot 300 rounds through my CZ75 SP 01 and Ruger American. I wanted to update my previous review. I used this ammo again today shooting it in 2 different pistols. I had one jam in my CZ75 PCR. Only shot about 150 rounds today. For some reason unknown, I found both pistols MUCH easier to clean than before. Even though it is slightly more "dirty", I didn't have the difficulty cleaning like I did before. Not sure why. I thought it was worth mentioning. I shot 300 rounds through my CZ 75PCR yesterday. It was my first time using steel-cased Russian ammo. I had one jam. I shot outside at metal targets and couldn't tell any difference in accuracy from the normal brass-cased inexpensive stuff I've always used. However, I just cleaned the pistol today and it was a real bear. I've never had such a difficult time removing powder residue off the chamber and bore. It seemed like concrete. Usually I can give a quickfew passes with a bore brush, a few with a bore snake, and a few oil soaked patches and I'm getting close to pulling out clean patches. I had to scrub the barrel for a long time with a plastic brush before it visually didn't have any buildup on the barrel. It added at least 15 minutes to the task, and I still dont think my chamber is clean by my standards. You can visually see the buildup that takes conseiderable scrubbing and still persists. I think when I'm finished with this 1000 rounds, I'm going to by some higher quality ammo next time. I wouldn't want to use this ammo in a nicer gun too. Great price, but the amount of labor and potential abuse to the firearm over time isn't worth it to me personally. Have experienced no problems with this ammo. No light loads. Great price and great service from AMMOMAN. Just purchased another 1K rounds. Though this ammo is very consistent and regular and decent groupings can be had it does burn "dirtier" than either Wolf, Bear or Red Star ammo from the former "com-bloc" countries. It is currently being sold at a price well worth cleaning a little simple carbon fouling and no, it isn't overly excessive. This ammo reminds me of the original Wolf ammo when it first came available. Burnt a bit "sooty" but you could count on it to go "bang" every time. You might have to clean your chamber at about round count 1000 to remove lacquer buildup as to tell the truth I fired a friends ammo purchased from Ammoman of this brand but have almost a case from another supplier on hand in 9mm. I know that Tula's hard to find .308 loading can be dirty enough to be problematic in AR platform rifles chambered for the heavier NATO round. 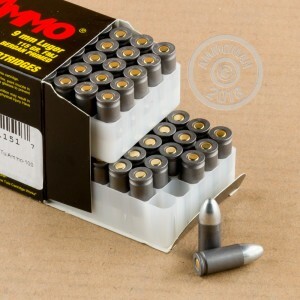 All in all at the price Ammoman is selling this ammo delivered per 1000 round case its purchase is a no brainer for practice grade ammo. Just use your boresnake and plenty of crud buster after a good shooting session. THIS IS A GREAT BUY AT THIS PRICE despite it minor difficulties which Wolf, Bear and Red Star have overcome, especially Wolf and the Polycoated Bear ammo. Red Star is only half a step ahead of Tula. This is all in my humble but experienced opinion after firing tens of thousands of rounds of various primarily "Com-Bloc" ammo (I am a cheapskate). Wolf and their Polyformance line is as good as ANY American made hardball ammo. I would shoot Tula before I shot American made ammo that comes in aluminum cases so. BUY THIS AMMO AND YOU WILL GET TO PRACTICE MORE! It works for rang just fine. Some of the rounds seem a bit long and can be tough to load. For the money they are great. not what I enjoy shooting because it is steel, but like I said price is right. ordered 2000 rounds in Sep 2015, shot them all with no problems. Great product for a great price. You get what you pay for. It tends to jam a lot. I ended up spraying a little WD-40 in my mags and that helped a little. I run this ammo in informal matches and it runs 100%. Cheap and reliable practice. Folks gripe about the steel case, but they work great and are not nearly as dirty as I expected. I haven't found a reason to buy more expensive ammo. It's decent ammo. A few specs of rust but very limited. I put it in an ammo can with silica so it shouldn't be a problem. Shot 250 rounds one afternoon without a problem. For an extra $40 it may be worth getting PMC instead, because you run the risk of the enamel gluing itself to the bore. It is also a bit better quality also. Went out shot 250 rounds, no problems, no light loads,great ammo.